Hot cocoa or hot chocolate is a popular drink made by adding cocoa and sugar or chocolate syrup to hot milk. The drink contains very little cacao, so the caffeine content is very low. However, adding more cocoa or chocolate syrup than directed will increase the caffeine content. Some brands also add powdered milk to their hot cocoa mix in order for the beverage to be made with plain hot water. Hot cocoa or hot chocolate shouldn't be confused with hot drinking chocolate or a mocha. Hot drinking chocolate is usually made with cocoa and real melted chocolate for a very rich and thick consistency. This will have more caffeine. 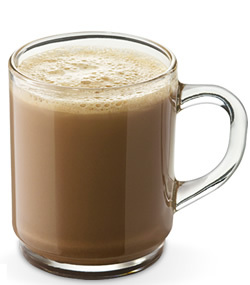 A mocha is made with espresso, cocoa powder, and steamed milk, so it will contain significantly higher caffeine. Although hot cocoa is a popular drink for children, parents should be more concerned with the sugar it contains rather than the small amount of caffeine in the beverage. Sugar content: 24 grams (per 8 ounces). How Does Hot Cocoa (Hot Chocolate) Compare? Hot Cocoa (Hot Chocolate) contains 0.62 mgs of caffeine per fluid ounce (2.11mg/100 ml).